Swatch Group is an international company, headquartered in Switzerland. 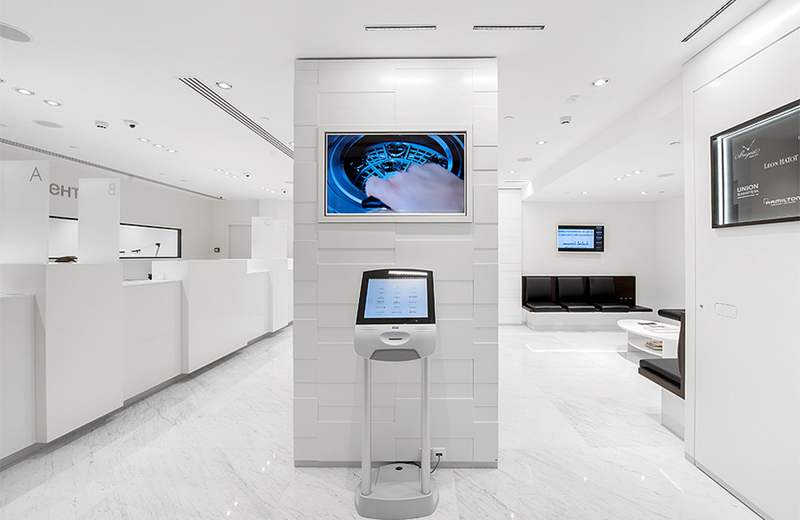 ABD architects had non-standard task to design office and also service center for watches repair and maintenance. Swatch Group includes 18 brands, including luxury brand watches, so the office interior should be concise, calm, but also bright and elegant. Entrance lobby is done by light faced materials; the interior is solid, with a minimum number of details. All communication lines in the reception area were implemented in adjacent areas to exclude out the ceiling hatches presence. Ventilation grilles are hidden in black niches with lights. Contrast sets by space area with wood paneling, with built-in illuminated boxes for correspondence and wardrobe, as well as colorful wall with Swatch watch. At each entrance to the work area are established wardrobes with forced ventilation and perforated for better air circulation. Almost all office engineering system is open on the ceiling. Some open-space workstations have bright flooring, ceiling systems are painted white. The passage is highlighted with dark carpet that graphically repeated pattern on the ceiling. The sprinkler system is painted in red and plays role of a vivid art object in space. Workstations are made of white material, except in the center and countertops storage enclosure of veneered panels. 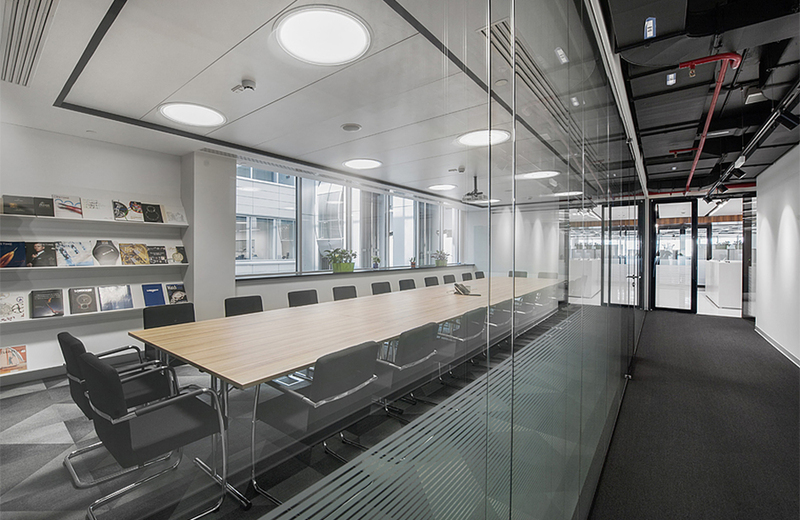 Panels with built-in lights are installed in meeting rooms for creating comfortable acoustics. They absorb noise and simultaneously uniformly illuminate work surfaces. Meeting rooms are equipped with racks for storing magazines. On the white stemalit walls you can draw graphics write comments during discussions or presentations. In small meeting rooms and informal communication zones are lighted with bright red lamps bright accents in the space, their felt surfaces also absorb noise. The office kitchen is a separate room with dining table, fridge and microwave. In addition, there are two small coffee points with built-in coolers and storage for water bottles. Also in the coffee-points bars counters installed so employees may have work discussions during coffee or tea. According the customer’s task the office design supposed to be strict and concise, but architects were given complete freedom in the design of bathrooms. So they decided to move away from standard solutions to creative and colorful. They found artists who worked with the Swatch Company over the years and used their paintings. At the end each bathroom has turned out to have unique design own character. The service zone is completely technological space with storage systems for handling, repair and maintenance. Service centers have their own technical requirements for interior such as flooring particular material and color (to eliminate static and the possibility of finding the fallen item), the walls should be white, and the lighting must be at least 1000 lux. The service zone is almost an operating room, just for watches only. The whole technological area is open to the public. And if you go down the hallway through the glass window at eye level you can see the whole process of watch repairs. Both office and service center have joint passes for the necessary communication between employees.